See our catalog page for the current catalog issue. 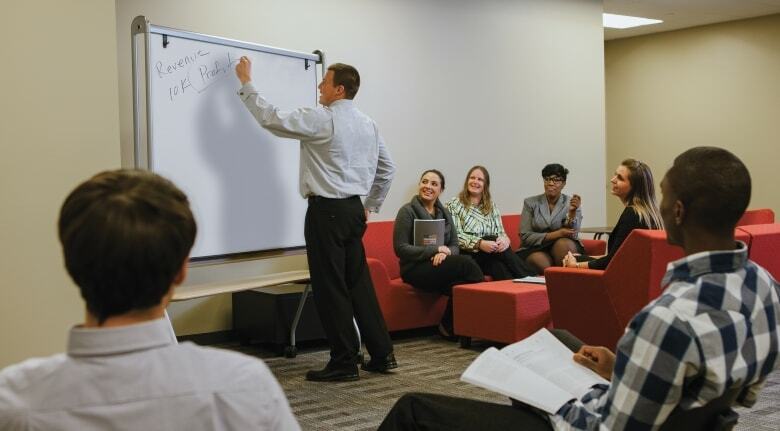 The Davenport MBA is offered in many different ways. Our reputation precedes us, and with this degree, so, too will yours. Davenport University has long been noted for the breadth, professionally focused and practice-based approach to accounting education. The choice of multiple tracks readies you to sit for the CPA, CMA, CIA or CFE exams, or choose to focus more broadly on general accountancy or a finance emphasis. We are also one of only a handful of programs in North America offering graduate-level concentrations in Fraud Investigation, Managerial Accounting and Internal Auditing. Less about numbers. More about management. This degree is tailored for those with or without a prior business degree or prior business experience. It is a perfect complement for those with technical degrees or for those who are called upon to manage and motivate human capital. More effectively lead innovation and learn the necessary skills of strategic planning, change management and organizational design. All College of Business Degrees. You will be qualified to manage, analyze and transform health information into meaningful intelligence. Join our successful graduates in this fast-growing field. This program provides practice-based education that prepares students for contemporary and emerging areas of practice in occupational therapy. Offered only as a full-time program at the W.A. Lettinga campus, be a part of a cohort of students who will progress through the program together. Master’s Programs in Nursing (National League of Nursing, 2010). FNPs are advanced practice-registered nurses who are licensed, certified and independent practitioners that serve as primary care providers to deliver family focused care. FNPs provide high quality, cost-efficient healthcare to a diverse population. A graduate certificate is also available to the nurse who already has a Master of Science in Nursing. Capitalize on your tech brain and position yourself to innovate as an entrepreneur in professional level positions or in preparation for subsequent doctoral study. Deepen your knowledge and skills in high demand areas of computer visioning, artificial intelligence and pattern recognition in this challenging, 30-credit program. Effectively address the management of risk to organizational and individual information assets, building secure systems that protect confidentiality, accessibility and integrity of these assets. We are proud to be a designated Center of Academic Excellence by the National Centers of Academic Excellence in Information Assurance Education which is jointly sponsored by the National Security Agency and the Department of Homeland Security. This program has relevant and great long-term professional opportunities. This program provides a high quality, interdisciplinary technical and business graduate degree for professionals interested in or presently leading information technology or technology-intensive organizations. Areas of program emphasis include information systems planning, product and project management, risk mitigation, business continuity, total quality management and return-on-investment analysis. Specialized courses are offered in wireless networks: accounting information systems: and banking and financial security, complementing courses emphasizing leadership, change management strategies and technology entrepreneurship. You will also be prepared for the Project Management Professional certification exam developed and conducted by the Project Management Institute. Our Master of Urban Education degree is an alternate route toward teacher certification. This program provides extensive practical experience so you can develop the skills conducive for effective teaching in urban schools. New teachers are trained in real-world classrooms, allowing practice of newly acquired skills in real time. Current teachers can fine-tune urban teaching practice through application of our innovative curriculum. You can make a difference in the lives of urban youth while fulfilling credential requirements and obtaining a master’s degree.